Is this the best ultralight alcohol burner for summer backpacking use? After testing it on my recent 280-mile hike in the Scottish Highlands, I think it just might be. First, some context. 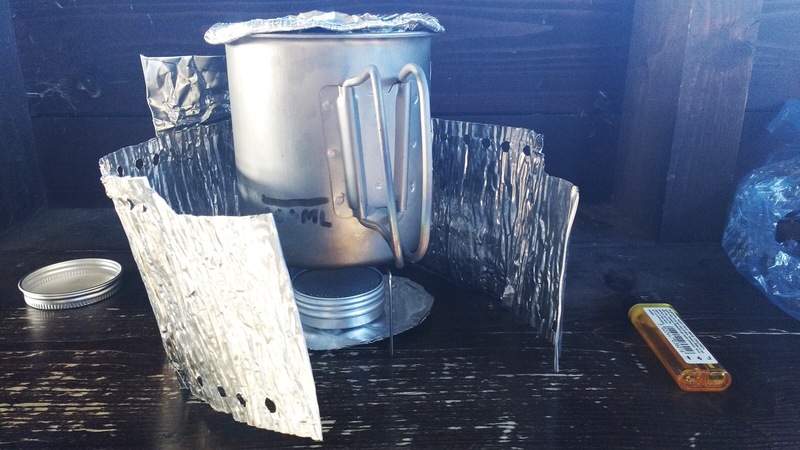 You can read about my journey from alcohol burners to canister gas and back again in my article Lightweight stoves for backpacking: the alcohol option. 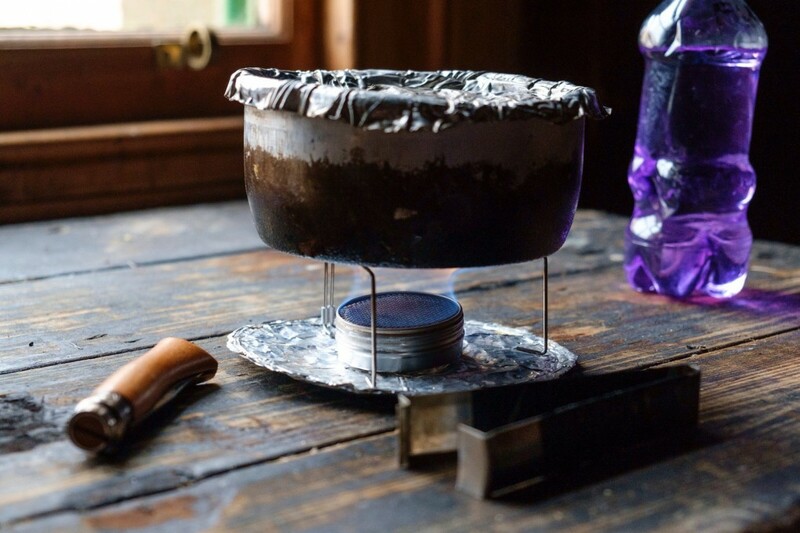 In April 2015, I’d decided to give alcohol stoves another try and had cobbled together a system out of my old Trangia Mini pot stand, an ancient foil windshield, and the Trail Designs 12-10 burner. While this worked just fine, it was not as light or as efficient as it could have been, and I continued to experiment1. I first heard about Speedster Stoves through the Twitter grapevine. It’s a British micro-business run by backpacker Gary Green, who makes cheap, practical, no-nonsense and ultralight kit by hand, selling it both on his own website and through an EBay store. 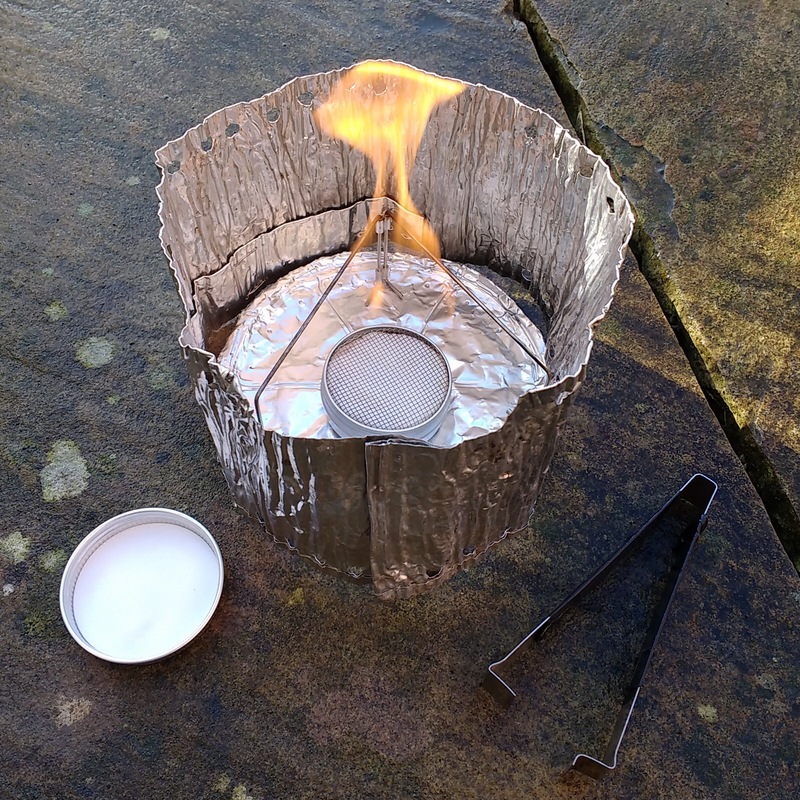 The Speedster burner I selected (properly called the ‘30ml spill-proof meths/alcohol burner‘) is deceptively simple. It’s just a screwtop metal container, slightly larger than one of those small pocket tins of Vaseline, filled with an inert asbestos-free medium which is kept in place with a layer of wire mesh. The burner weighs 14g and has dimensions of 53mmx20mm. Lighter DIY Coke can burners are possible, but this is the most compact practical alcohol burner I’ve seen. The clever bit is that fuel is soaked up by the material under the wire gauze, so it’s incredibly safe. Unlike most meths stoves, if you tip this one over – unlikely due to its low centre of gravity – there will be no fireball of spilled fuel. You also don’t have to worry about precisely measured fuel doses or decanting excess fuel back into the bottle (things that make most UL burners a faff to use). After you finish cooking you just screw the lid back on and store the remaining fuel in the burner. This means zero fuel wastage. No priming is necessary either; just touch a lit match to the wire gauze. It’s possible, but more difficult, to light it with a firesteel. Did I mention the cost? It’s £3.50. You might be forgiven for thinking this sounds too good to be true. Surely a home-made stove costing £3.50 can’t be practical to use? Surely it takes ages to boil, or guzzles fuel, or has some other major flaw? By itself, the burner won’t achieve much. You need a pan (obviously), some kind of pan support, and a windshield. I already had a pan and a windshield, but the Speedster burner I ordered came with an ultralight folding pot support made from steel wire. This stand is an absolute marvel. It weighs 10g and folds flat for easy storage, yet is stable under the weight of a surprisingly big pot – and it can easily cope with uneven ground. It’s the best design I’ve seen for an UL pot stand. 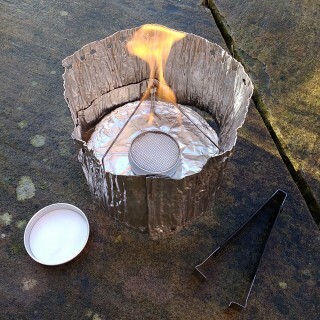 I also made a reflector/stove base out of a Reflectix offcut stapled to a bit of foil from a pie dish. This insulates the burner from cold ground and reflects heat back up at the pot. Speedster sell these separately too. The total rig, including saucepan, pot lifter, pot cosy, fuel bottle and titanium spork, weighs 300g – and I could go as low as 200g if I upgraded to a titanium pan and left the pot cosy at home. That’s pretty much as light as it gets for an alcohol setup, and it all neatly packs inside the saucepan for storage, unlike the Caldera Cone2. I tested the Speedster setup a few times before departing for my hike, and was surprised by the consistently good boil times it managed to achieve – less than six minutes for 500ml of water, which is about what I was getting with my Caldera Cone. In fact, I pitted it against the Caldera Cone several times and it was usually a draw. Given the small and comparatively inefficient windshield I’m using with the Speedster, that was a surprise. It burns fairly clean most of the time, with a steady blue flame. You extinguish the stove by dropping the cap on and waiting for it to cool. How about in the field? To be honest, there is little to report. The setup did its job flawlessly over 21 days of hiking, consuming less than 500ml of fuel in that entire period. That’s about as efficient as any practical alcohol burner I’m aware of. If I could sum up the Speedster’s performance in one word, that word would be dependability: it always did its job without deviation from what I expected it to do, even when the wind was a bit gusty or the water was only a degree or two above freezing. One of the common complaints about meths stoves is that they can be fiddly to use in the field, but that isn’t the case here. It just quietly gets on with what it’s supposed to do. It isn’t perfect. You do need a windshield to get consistent performance – try using it without one and you’ll struggle to achieve a boil. After a while I found that screwing and unscrewing the cap became a little stiff, and the plastic seal inside soon came off (although I didn’t notice any leaking of stored fuel afterwards, so I don’t think this component was actually necessary). The wire pot support got a bit bent when I stepped on it, but I bent it back into shape and it still works just fine. It also doesn’t really have the horsepower to do heavy-duty tasks such as melting snow or performing in very cold conditions, but it’s arguable that such tasks are beyond the job description of a small alcohol burner. This stove is ultralight, costs £3.50, it’s hand-made in the UK by a cottage manufacturer, and it performs as well as the best alcohol stoves money can buy at any price. Its disadvantages are largely those inherent to ultralight alcohol stoves in general. Put simply, if you’re inclined to use an alcohol stove on the trail, there’s very little reason not to buy this one. Even if you normally use a gas stove, the Speedster is so small, light and cheap you could easily keep it as a backup. Disclaimer: I purchased the Speedster Stove with my own funds and have no relationship with the manufacturer.